Astaxanthin is nature's strongest antioxidant and is an all-natural product that supports healthy functions of the joints, tendons, eyes, immune system and skin. Astaxanthin is an all-natural product with incredible antioxidant benefits. It is a microalgae that's grown in fresh waters off the coast of Hawaii. This phytonutrient is extracted and concentrated into a small gel cap. Astaxanthin is the most commonly occurring red carotenoid in marine animals. It is produced by the haematacoccus pluvialis algae. This carotenoid is produced to protect the algae against the effects of UV radiation when water supplies in its habitat dry up. Astaxanthin is part of the diet of salmon and shrimps and is responsible for the pink color in their flesh. Our Astaxanthin is harvested in Hawaii by Cyanotech Corp., the leading harvester of astaxanthin. The product is grown without the use pesticides and herbicides and its growth does not contribute to land erosion or water pollution. It contains no genetically modified organisms (GMOs). How do I take Astaxanthin? Astaxanthin sold by Good Cause Wellness comes in small 4mg capsule. The recommended daily consumption is 1-3 capsules. 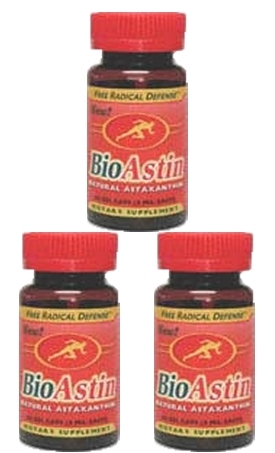 In his review of Astaxanthin posted at www.NaturalNews.com, Mike Adams recommends taking Astaxanthin along with a healthy fat. Astaxanthin is fat-soluable, which means it uses fat molecules to delivery benefits directly to tissues and organs. "(Astaxanthin goes) directly to tissues and organs in your body where it can do the most good, like your retina, your brain, your breast tissue, prostate tissue, and skeletal muscles," according to Adams.